I was raised by a wonderful mother who taught me to always try home remedies first to heal whatever is ailing me. I’m the oldest of 8 children, and to this day I’m astounded at how little we ever had to see a doctor when we were sick. My mom just always knew what to do. Thankfully she passed this wonderful knowledge onto me and my siblings and I’ve used it in my own family with my kids. Obviously, I’m not a doctor or medical professional. I am only sharing what our family has found to work in our own home. I’m a fan of modern medicine also, I just believe in doing everything in my home as naturally as possible first. My kids visit the doctor for their annual physicals and other times if necessary, but who wants to drag their kids to the doctor for every sniffle, sneeze, or fever? 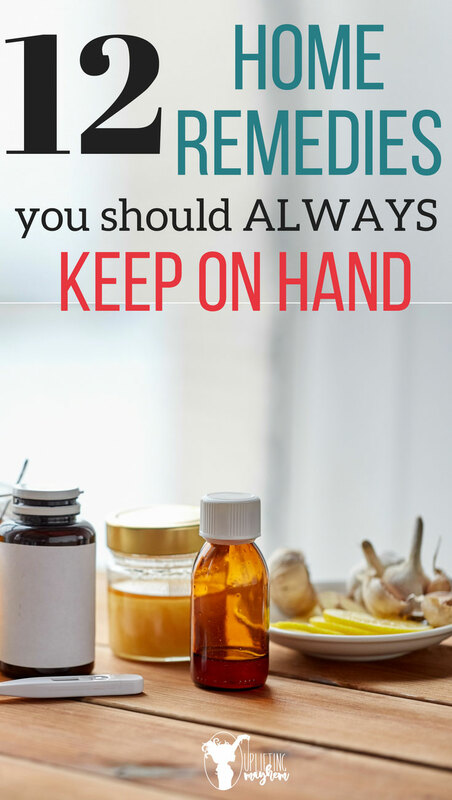 Home remedies have saved us so much money in the long run on doctors visits and I believe they do a great job of assisting the body in healing itself. 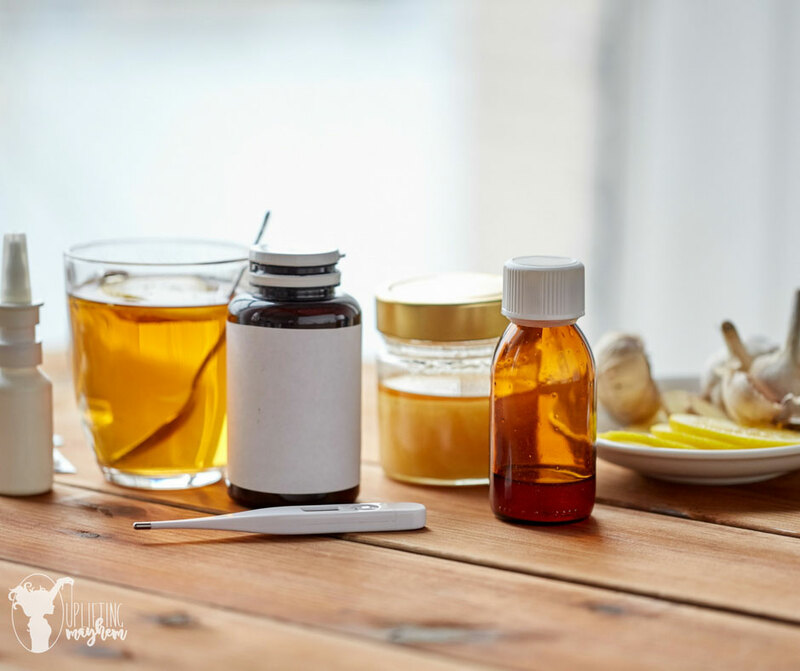 When my usual home remedies, don’t work, or things take a turn for the worse, I make an appointment with our family doctor or visit the Instacare. With a very active boy, we’ve had our fair share of Instacare visits for stitches, etc. I’ve learned with using natural remedies, that PREVENTION is key. It’s best to keep as healthy as possible to begin with, to avoid being sick in the first place, but when sickness DOES hit, to immediately take action. My husband learned this with soar throats. If we waits too long, he’ll end up at the doctors office for an antibiotic but if he attacks it right away, he’ll usually be fine. I LOVE essential oils! I have a little basket where I keep all my favorites (out of reach to the kids) and I use them often. They have helped us so much with everything from scratches to sprains and bruises. For more info on my favorites and what I use them for click here. This a no-brainer for most. Everyone knows how good vitamin c is. We love to use Emergen-C as an immune booster and also at the first sign of sickness. It works great for back to school germs! My kids also love to drink it because it tastes great. My favorite flavors are tangerine, pink lemonade, and Acai berry! Otherwise known as grapefruit seed extract, this stuff is powerful! Remember when I talked earlier about my husbands soar throats? This is his remedy: he mixes up a glass of emergen-c and adds about 5 drops of GSE (we never use the recommended amount on the bottle because it is SO strong). He does this the minute he starts feeling sick and repeats the process several times during the day and the next day until he feels better. One time I loaned our GSE to a friend and the next day he called me from work and said,”Where is our GSE?? I went to use it this morning cuz I was feeling sick and it wasn’t there. Now it’s getting worse!” A word of caution, though, this stuff does not taste good, but we found if added to orange juice, it’s undetectable! My kids never know when I give it to them this way, but otherwise they REFUSE to take it. When one of my daughters ear drum ruptured, my doctor said that I could use colloidal silver in her ear instead of using antibiotics. Sure enough, it worked and healed up just great. Since then, I put a few drops in my kids ears whenever they complain of an earache coming on. It’s worked every time so far. Again, consult your doctor if you have any questions or concerns. If I ever feel unsure about using something or feel that I need to take my kids in to the doc, I do. Call it mothers intuition if you want, but I’ve learned to listen. These little babies taste like candy and they saved me during my last pregnancy! I used them after meals or in the evening when I felt heartburn coming on and I didn’t end up needing antacids until my last week. Granted, if you have serious heartburn like my sister, these may not work for you. I also give them to my daughter who has a hard time digesting dairy and to any kids that complain of tummy aches. We recently found these worked great for my daughters ears. She gets massive amounts of ear wax and if we don’t get it cleaned out, it eventually builds up to where she has a hard time hearing. I used to take her to the ear, nose, and throat doctor to have them cleaned out, but they told me to look for earwax softening drops to do it at home. These worked great at softening the wax so it could be easily removed with warm water and hydrogen peroxide. My mom introduced me to this when I was single and lived away from home. It tastes great and is once again great for preventative and hitting a sickness right at the beginning. I love this syrup for kids because it tastes great and my kids never complain about taking it. Sounds disgusting right? My doctor asks me every time I take my kids in if I’m giving them their cod liver oil regularly. It’s wonderful at helping children(or distracted mommies like me) focus. It also helps to regulate my crazy hormones and helps with depression. I noticed though, that it takes a few weeks of taking it consistently to really notice a difference. My kids will take it straight if I mix it with orange juice or they LOVE this stuff. I always make sure that it is purified and free of heavy metals like mercury. I have found through experience that this works the best (for us) when my kids are vomiting over and over and I am worried about them getting dehydrated. For some reason, it’s easier for them to keep this down than Gatorade or anything else. Sometimes I have to give it to them a teaspoon at a time if they’re really having a hard time. It helps to calm the stomach so they can stop throwing up and then eventually take on normal liquids again. We have started buying this in bulk. I use it in cooking and diluting essential oils, and for dry skin. If you look up its benefits (here’s a really good post on the health benefits of coconut oil and a bonus DIY shave scrub) you’ll see they are almost endless. My favorite? I love to use it on my newborn babies for cradle cap. I rub it in really good, let it sit for about 15 minutes, gently scrape as much of the cradle cap as I can with a baby comb, wash really well, and then apply coconut oil again after. After a couple of times doing this, it is usually gone. I had a new mom stop by my house once out of desperation because he didn’t know what to do for her babies cradle cap, I sent her home with some coconut oil and she was so happy with the results! I was so happy when I found this for the flu. If you think I’m crazy, look it up. It’s a homeopathic that you take at the first signs of flu. So easy. Just tiny little sweet pellets that melt under your tongue. Last flu season, we gave this a try and I was amazed at how much it shortened the duration of the flu and made the symptoms so much easier to handle. I know this because my husband was the first one to get it and I forgot to give him this until it was too late and he was miserable and out of work for 2 weeks straight. When the kids and I started showing signs, I immediately started using this and we never had it NEARLY as bad. I am definitely keeping this one in stock!! They also have a children’s formula. With my last pregnancy, I could not live without magnesium. It was the first time I had tried it. Someone told me it was great for alleviating constipation (what pregnant mom hasn’t experienced that??) and also restless leg syndrome. I found this powdered kind that you drink to work MUCH better than capsules. Not only did I have less incidents with restless leg that pregnancy, but it totally kept me regular AND THIS IS THE BEST PART: my hip pain while sleeping went WAY down. Instead of turning from one side to the next every 15 minutes, I could go hours. That was a lifesaver. There are so many other benefits from magnesium but those are my favorites. Hopefully, one of these can help your family this year when the nasty bugs hit. Stay healthy and happy!